The Class A commercial driver’s license is the most comprehensive license you can receive, allowing you to drive and operate just about any truck, trailer, or vehicle in the commercial trucking industry. Thankfully, LA Truck Driving School’s Class A CDL training program is one of the best in Los Angeles. We provide you with all the tools you need to become a successful driver, giving you the skills to start your new career fast. What Is A Class A Driver’s License? If you want to become a professional truck driver, then you’ll definitely want to get a Class A CDL. With a Class A license, you’ll be able to operate any legal combination of vehicles, including those under Class B and Class C ratings. You can also tow any single vehicle with a Gross Vehicle Weight Rating (GVWR) of 10,000 pounds or more, providing the flexibility you need carry whatever comes your way during your career as a truck driver. Flat Fee. No hidden Fees Or Re-Test Costs! The American economy runs on trucking, and the trucking industry is in constant need of qualified drivers. As a trucker, you’ll be able to find steady work with great pay, providing the economic stability you and your family need. Our students’ needs are our top priority, which is why we’ve created an all-inclusive Class A license program focused on giving you everything you need to succeed. Our program will provide you with all the standard educational papers and booklets you’ll need to study outside of the classroom, as well as comprehensive skills tests aimed at teaching you the essentials of Class A driving. We’ll also teach you about common pre-trip practices like walk-around inspections, cabin inspections, and checking your air breaks. And thanks to our one-on-one instructional methods, you’ll receive the attention you need to become a truly great trucker. 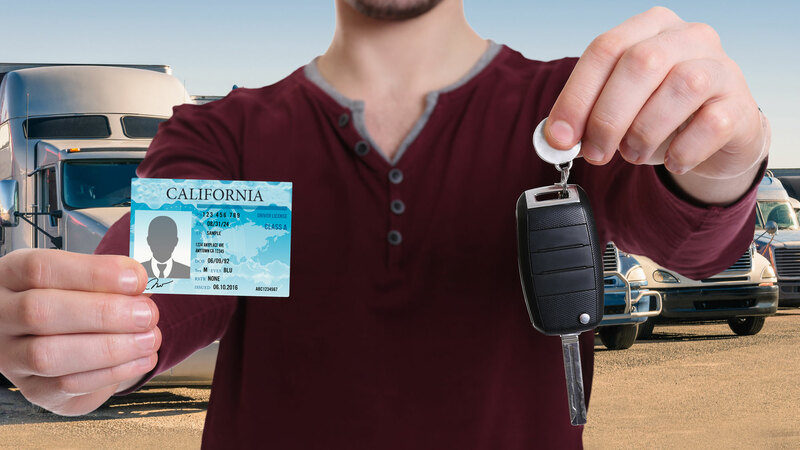 Our team will even help you reserve time for your final Class A CDL test with the DMV, providing you a truck for the exam and getting you properly certified with the State of California. LA Truck Driving School’s training programs are designed to help you succeed, but we know that different drivers learn at different rates. If you fail your DMV-administered CDL test, don’t worry, because we offer no extra costs for re-tests. Our flat-fee driver training programs provide the flexible schedules you need to succeed. We’ll work with you to improve your skills until you pass your CDL test, helping you throughout the difficult certification process. The trucking industry is the biggest paid industry in American, bringing millions of dollars to the economy and providing lucrative careers to truckers across the country. With a Class A CDL, you’ll be in an elite group of professionals able to operate almost any type of truck or vehicle, transporting cargo wherever it needs to go with ease. LA Truck Driving School’s comprehensive Class A license school will have you on the road in no time, working for some of the nation’s top trucking companies or working solo as the owner/operator of your own trucking business. Let us provide the comprehensive training you need to earn your Class A CDL license. For more information on our training programs, contact LA Truck Driving School today. With no hidden fees or re-test costs, we are offering an unbeatable price of $1,799 for our all-inclusive Class A License training program! This package includes all the educational papers and booklets needed to ace your exam. Not to mention, we will be providing hands-on training, including a skills test to check for backing up and parking. To even further ensure your success, a team member will provide training, driving with you through streets and highways! Not to mention, we will be administering a walk-through exam to ensure that your entire vehicle is inspection ready! Lastly, when you’re all good to go, we will set you up with a DMV reservation for your final test with LA Truck Driving School!